Make slow cooker brown rice chicken congee for the perfect comfort food this winter, loaded with fresh ginger and cooked in broth, water and soy sauce. Who’s ready for the first recipe of 2018? I’m so excited to share this slow cooker congee recipe because in the past couple of years, I’ve fallen completely in love with congee. Especially as our winters have been extremely cold with of all this polar vortex nonsense. With cold weather comes comfort food, and while I grew up eating chicken noodle soup, I’m always fascinated by the comfort foods enjoyed in other parts of the world. Congee is something that I didn’t grow up eating, but there are different versions eaten all over the world. It’s most popular in East Asian countries, but even Greece and Cyprus have their own (often very lemony) versions of congee. In basic terms, congee is a savoury rice porridge. In Canada and the US we use oats for our porridge, in many Asian countries, rice is the grain of choice. The rice breaks and disintegrates into the liquid during a long cooking process. It’s a dish that is often served when people are feeling sick. The first time I tried it was a couple of years ago when a friend of mine made it on a particularly cold day. Right away, I was in love. The savoury/salty combination is one of my favourites so this recipe is inspired by the dish my friend served me which was a ginger chicken congee. It’s a delicious savoury rice porridge that is created as rice disintegrates after prolonged cooking–sounds perfect for the slow cooker, don’t you think? I’ve only had congee made with regular rice before, but I wanted to try and make a bit of a different version for January, so this recipe uses brown rice, which holds up perfectly in the slow cooker. Along with the rice, you add one chicken breast, a clove of garlic, tons of fresh ginger and hot pepper flakes to the liquid. For cooking the rice I’m using a combination of chicken broth, water and soy sauce. I like to combine water with the chicken broth as if you’re only using broth the final dish may end up a little on the salty side. Using water allows you to better control the salt element of your dish. The toppings can be whatever you like, but I opt for salted peanuts, green onions, cilantro and a healthy dose of sesame oil. What I love about this slow cooker recipe is that it is one of those ‘set it and forget it’ recipes that doesn’t require any searing or sautéing ahead of time–everything cooks perfect in the slow cooker because this is the kind of dish that is meant to be “mushy”. 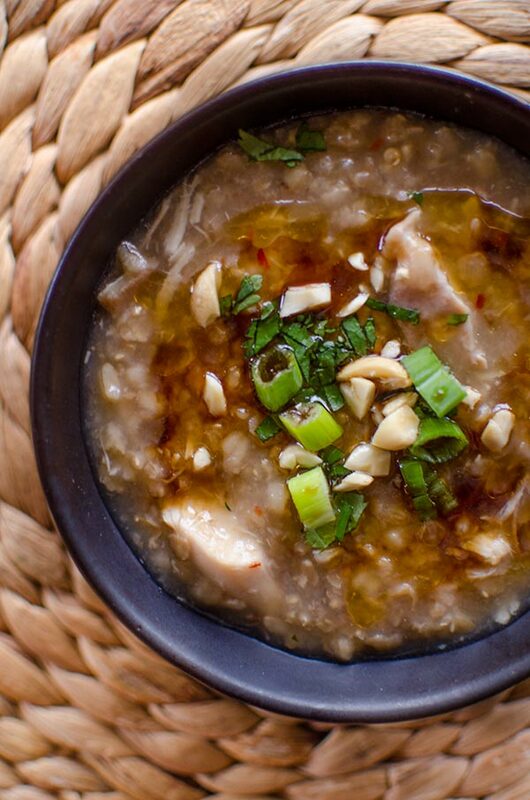 Congee is also a dish that you can literally eat for any meal (breakfast, lunch or dinner)! If you want to make a vegetarian version, just leave out the chicken and swap the broth and you’ve got yourself the perfect vegetarian congee recipe. Add brown rice, chicken breast, chicken broth water, soy sauce, ginger, chili flakes, garlic and salt to slow cooker. Once done cooking, stir (add a little more water if needed), remove chicken, shred into pieces and add back to rice (discard bone). Stir in sesame oil and lime juice, serve with toppings. 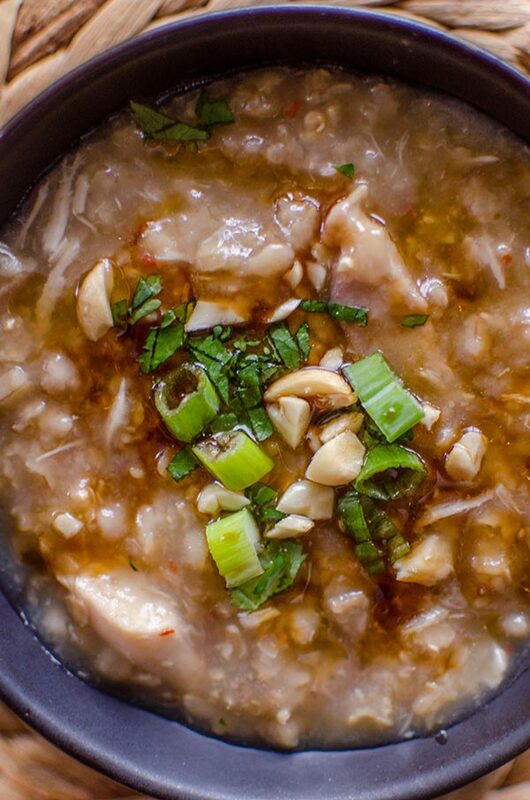 Let me know if you give this slow cooker brown rice chicken congee a try in the comments below. Hi Cheryl, the congee will have a porridge-like look, the grains of rice will have broken down quite a bit and will be slightly stodgy. Once the slow cooker is done, give it a stir and you can always add a little more water if needed and if it seems too thick. I hope you enjoy! Thanks for the instructions! Am just making a batch myself now. Just commenting to say "1 tsp Hot child flakes" proved to be a little difficult to find but I made do. .
Ha, thanks Jo! Total auto-correct. I hope you enjoyed! I made this yesterday and it was more of a soup, not at all a porridge. I'm trying again with two cups rice instead of one cup. The flavor is wonderful - no complaints there.